Accountants and tax advisers HWB have donated more than £5,000 to The Murray Parish Trust following a huge company-wide fundraising drive throughout 2018. Employees at the Hampshire-based practice have rallied round in a series of fundraising events to raise the grand sum of £5,802 for the charity. All the proceeds have gone towards the trust’s #2MillionSteps appeal, which is raising money to build a dedicated children’s A&E department at University Southampton Hospital. The main drive for funds came in April 2018 when a group of 15 HWB staff took on the Three Peaks Challenge, raising £3,800. The team covered 462 miles in 28 hours and walked 23 miles – before many of the team returned to work the next day. Other fundraising initiatives have included a month-long charity auction with prizes donated from a range of businesses and organisations in the region, including Paultons Park and Ageas Bowl. Fun events have included a Halloween Pumpkin Carving Competition, bake sales and a Christmas jumper day. HWB Director Gary Brown (pictured) said: “We are delighted to be able to make this donation to The Murray Parish Trust and are pleased it’s another step towards building this world-class health facility that will help so many families across the region. 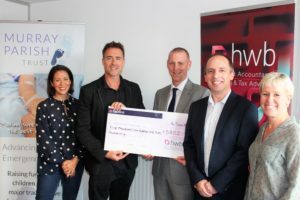 The Murray Parish Trust was set up by actress Sarah Parish and her husband James Murray, who have raised thousands of pounds for Southampton General since losing their daughter Ella-Jayne, who was treated there in 2008. The Trust is working alongside the Southampton Hospital Charity to reach the £2m target, which will be match-funded by the government. A further £1.1m is to be allocated by University Hospital Southampton NHS Foundation Trust to build the £5.1m unit.